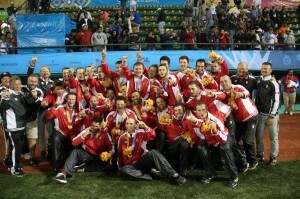 The 2011 Team Canada Senior National Team, managed by Hall-of-Famer Ernie Whitt, had a storybook year in taking their first-ever gold medal at the 2011 Pan Am Games, held in Guadalajara, Mexico that followed their second consecutive bronze medal at the World Cup, held in Panama City. Canada now is ranked sixth in the world by the International Baseball Federation, its highest ever. While Canada is also peaking at the Major League level, with a record 26 natives having seen time in 2011, Whitt only had three ex-major leaguers on his roster in Scott Richmond, Shawn Hill and Mike Johnson. The teams Business Manager was Windsor’s Bernie Soulliere, who was Inducted into the Ball Hall with Whitt in 2009. Fellow Windsorite third base coach Stubby Clapp was a member of Canada’s 1991 World Jr. gold medal winning team that was inducted into the Ball Hall in 1992.At the Pan Am Games, Canada opened with a 5-4 over Puerto Rico, and then lost to Cuba 9-5. After beating Venezuela 4-1, which qualified them for the medal round, Team Canada edged the host Mexico 5-3 in the semi-finals, and took down the undefeated USA 2-1 to win gold. Andrew Albers, from North Battleford, Saskatchewan, who chalked up a win and struck out 10 over nine innings in two games, compiled an ERA of 1.86. James Van Ostrand, of Richmond, British Columbia, led Canada offensively with nine hits in 19 at bats for a .474 average, an on-base percentage of .565 and a slugging percentage of .579. In the World Cup, where Canada has only won two medals ever, Whitt’s troops opened with four consecutive victories, winning 9-1 over Puerto Rico, handing World Baseball Classic defending champion Japan 3-1, a mercy-rule 12-2 spanking of Greece, and 4-0 shutout of Chinese Taipei. Following a 12-3 loss to Panama, Canada then beat The Netherlands 5-4 and took down the USA 6-1. Australia then handed the Canucks their second loss 7-0, but Canada rebounded with a 7-0 win over Venezuela and a 4-0 blanking of South Korea to complete the qualifying round. Cuba came on strong to beat the Canadians 8-2 in the semi-finals, and rainy weather prevented the bronze medal game against the USA from being played. Canada was awarded the bronze based on their earlier defeat of the Americans. Jonathan Malo, of Joliette, Quebec, was named to the Tournament All-Star Team, going 13-for34 at the plate for a .382 batting average. Albers chalked up a pair of wins and a sparkling 0.00 ERA over four games, striking out nine over 15 innings. “I’ve got chills up and down all over again,” gleamed Whitt. Hamilton, the coach and director of Baseball Canada’s national team programs, who was recently named the most influential person in Canadian baseball, was also elated to hear the news. ‘It’s an absolute honour for our players, coaches and staff to be enshrined as a team in the Canadian Baseball Hall of Fame,” he said from his home in Ottawa. Andrew Albers (North Battleford, SK), Cole Armstrong (Surrey, B.C. ), Chris Bisson (Orleans, ON), Shawn Bowman (Port Moody, B.C. ), Nick Bucci (Sarnia, ON), Michael Crouse (Port Moody, B.C. ), Emerson Frostad (Calgary, AB), Mark Hardy (Campbell River, B.C. ), Jimmy Henderson (Calgary, AB), Shawn Hill (Mississauga, ON), Jay Johnson (Sussex Corner, NB), Mike Johnson (Edmonton, AB), Chris Kissock (Trail, B.C. ), Brock Kjeldgaard (Edmonton, AB), Marcus Knecht (Toronto, ON), Kyle Lotzkar (Delta, B.C. ), Jonathan Malo (Joliette, QC), Dustin Molleken (Regina, SK), Scott Richmond (Vancouver, B.C. ), Chris Robinson (Dorchester, ON), Jamie Romak (London, ON), Tim Smith (Toronto, ON), Skyler Stromsmoe (Bow Island, AB) and Jimmy Van Ostrand (Richmond, B.C.). Ernie Whitt (Clinton Township, MI), Stubby Clapp (Windsor, ON), Denis Boucher (Lachine, QC), Tim Leiper (Altoona, PA), Greg Hamilton (Ottawa, ON), Dave Blatz (Winnipeg, MB), Michael Derkach (Winnipeg, MB), Bernie Soulliere (Windsor, ON), Keith Sanford (Windsor, ON).